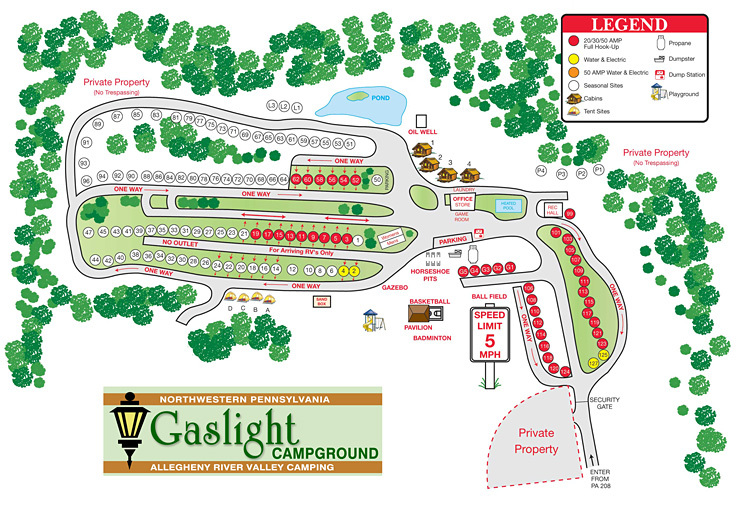 This site map designed and provided by Southeast Publications USA, Inc. © Copyrighted Material. You may click on this map to download and print a higher resolution PDF version. Adobe Reader required. Download a free copy of Adobe Reader by clicking on the following link. The following Rules & Regulations have been established for the enjoyment of all of our guests. Speed Limit: 5 MPH Speed Limit on campground roads at all times. It may be your child or grandchild that runs in front of you! Visitors: All campers are responsible for their site, children, guests, and visitors. All visitors are required to register and pay at office before entering campsite area. Day visitors’ check-out time is 10:00PM. One Camping Unit Per Site: No additional tents, screen houses, or canopies allowed. Pets: Pets must be kept on a leash and controlled at all time. Pet owners must clean up after their pets and never leave them unattended. Limit 2 pets per site. Behavior: Loud, boisterous, or profane language will not be tolerated. No throwing stones, littering or misbehavior in campground. Alcoholic Beverages: Alcoholic beverages are permitted at your campsite. No walking around campground with open containers. No one under the age of 21 is allowed alcohol. No kegs allowed. No alcoholic beverages in Rec Hall unless approved by management. Vehicles: No 4-wheelers (ATV's). Golf carts are allowed, but operators must be licensed and over 18 years of age. Motorbikes with current license plates are permitted to drive in or out of the campground only. Campfires: Campfires are allowed in campsite fire rings only. Do not move fire rings or bricks. Do not take firewood from other sites, wooded areas, or private property. Firearms & Fireworks: Firearms, air guns, weapons, and fireworks are not permitted in campground. Quiet Hours: Quiet hours are from 11:00PM to 8:00AM. All teenagers and children must be at their campsites by 10:00PM. Vehicle Washing: Washing of RV's or vehicles is not permitted. Pool & Restrooms: All children 12 years of age and under must be accompanied in the pool and restrooms. Rules posted in the pool area must be obeyed at all times. Waste Disposal: No dishwashing in restrooms (per Board of Health). Waste water from your unit must be dumped at dumping station (NOT on the ground). Hot grease is to be put into a suitable container and placed in the dumpster. Trash: Please put all trash and garbage in plastic bags, tie securely, and place in trash dumpster. Please crush large boxes before putting them in the dumpster. No lawn furniture, large items, or household trash in dumpster. Children: Children under 18 years of age must not be left in the campground without a responsible adult. Parents are responsible for the safety and actions of their children. Parents must pay for damage done by their children. Eviction: If you are asked to leave the campground due to noncompliance with our rules, there will be no refund of your site fee. Weather: Sorry, no refunds will be given due to weather. Bicycles: Bike helmets are required under Pennsylvania State Law. No bicycle riding after dark. Bikes are to be ridden on roads only and kept at campsite or bike racks. Privacy: Please do not walk through occupied sites. We hope that you enjoy your stay with us and will come back to see us again!